Yes, your kitty will feel like Neil Armstrong as they take ‘one giant leap’ onto the Uranus cat tree!! This marvellous kitty construction is great for homes with multiple cats, as there are several snuggly little hideaways where they can escape to and get 40 winks, should they so wish. If they are feeling a little bit adventurous then I can guarantee that Uranus will get them very worked up into a frenzy! 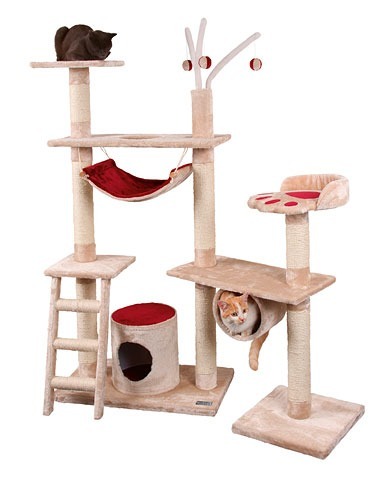 This cat tree can be extended up to a height of 265cm, making it one of the largest available on the market. Despite the colossal size of Uranus, it is incredibly strong and robust and Uranus and will be able to take a good old fashioned pounding from your kitties claws. All in all, this is a great investment for your kitties happiness and they will forever be at your mercy, if you show them Uranus.